I have been through the whole 'Support' section, and I can't find the help I need. What shall I do? Where can I find the datasheet for my data logger? Where can I find the Help Guides for setup, troubleshooting and settings configuration for FilesThruTheAir™ products? Where can I find the tutorial and set up videos for all FilesThruTheAir products? Where can I find software downloads for FilesThrutheAir products? Where can I find firmware downloads for FilesThruTheAir products? Settings will not save. What can I do? View page 8 of Help Guide 3: Network requirements and settings document for more information. How do I know if my router is 802.11b compatible? The sensor will not connect to the PC via USB. What shall I do? Restart the PC and reopen the WiFi Sensor Software. Check device appears in Device Manager You should see a COM Port labelled STMicroelectronics. Check that it is not disabled and showing as working normally. Change the COM port number. To change the COM port go to Control Panel, Hardware and Sound, Device Manager, Ports, STMicroelectronics Virtual COM port, Port Settings, Advanced and then select a COM port from the drop-down menu that is not in use. Windows Vista and XP may differ. What affects the battery life of my EL-WiFi sensor? How do I force a transmission from my EL-WiFi device? 3) Missing Drivers. If this is the case please reinstall the software. 4) Factory reset the device by depressing the front button for approximately 20 secs until the LCD display reads 'FA5r', then release the button, it will then be fully factory reset. Do not be tempted to release when it gets to approximately 10 secs when the display will change to read 'r5t', make sure you keep the button fully depressed. We do get a lot of customers who release too early and only reset the device! Check that the password being entered is correct. Check that 802.11b is enabled on the access point or router. Ensure MAC filtering is not switched on in the access point or router. If it is switched on, only known devices will be able to connect to your router. Check that your network has an internet connection. Check that the sensor is in range of the router. Check to see if the router has the latest firmware. If the access point or router has WEP Encryption ensure that the HEX key is being entered rather than the password. You can find the HEX key in the internal settings of your access point or router. Alternatively, search the web for resources to help convert your password to a HEX key. Check that DHCP service is running. This allows the sensor device to be allocated an IP Address. Normally, the DHCP service runs on either your router or on a network server. Make sure that the configured DHCP IP address range allows the addition of new devices if not, then extend the range. If your wireless network uses WPA Enterprise, make sure that the correct authentication type is selected from the drop-down box. Only the types listed are supported. If your access point or router has a wireless mode setting, this must be set to ‘Mixed’, not ‘Greenfield’. Make sure that the SSID name does not contain spaces. If using battery power you must set suitable sample and transmission rates as these will affect your battery life. You can power the device from mains using a suitable USB power supply if fast transmission rates or long-term, uninterrupted logging is needed. If there is a power outage, will I lose all my data? As the device is battery powered, it will always continue recording at the sample rate you have set. If a power outage occurs, the device will continue to attempt to connect to your network until power returns and the access point or router becomes available again. The device then synchronises all remaining data with the EasyLog Cloud. No data is lost. What battery life can I expect from my EL-WiFi device? There are a number of factors which can significantly affect the battery life of the sensor including; transmission period, WiFi encryption method, WiFi encryption key rotation frequency (determined by the Access Point or router), signal strength between access point or router and sensor device, presence volume and type of WiFi traffic from other devices, sample rate, and operating temperature. In our tests, we regularly achieve battery life in excess of six months with a transmission rate of one hour or more. How do I charge the battery in my EL-WiFi device? The sensor will arrive partly charged but ideally, you should charge it for 24 hours before use for optimum performance. The battery can be recharged via a PC, a USB +5V wall adapter, or a portable USB battery pack using the USB lead provided. * Please note that due to the heat generated whilst charging, WiFi devices with an internal temperature sensor will indicate a temperature a few degrees above the ambient temperature. Once fully charged, this heat generation ceases and the sensor will eventually indicate the correct temperature. This anomaly does not apply to data loggers with external temperature probes. How long will it take to fully recharge my EL-WiFi device? Can I permanently power my EL-WiFi device? How do I update my EL-WiFi device? The WiFi devices contain program code that runs internally, often referred to as firmware. You can update the firmware via the WiFi Sensor Software (v1.40.03 onwards) by clicking on the green ‘Advanced Tools' icon and then clicking on the green 'Firmware Updater' icon. You’ll need to connect the device to the PC using the USB cable provided then follow the on-screen instructions to download and update the latest firmware versions. To benefit from the latest improvements we recommend using the latest firmware releases for your devices. Depending on the previous firmware version, your device may be in a factory-reset condition following a firmware update, and will need to be connected to the Cloud. Any existing data for this device on the EasyLog Cloud will be archived for safekeeping. Where can I find full FAQs for EasyLog Cloud? I've forgotten my EasyLog Cloud password. How can I reset? If you forget your password, please use the 'Forgotten Password' link on the 'Sign In' screen, or click here. This will ask for your email address and will send you a link to reset your password. Is there a way to reduce the number of email alerts I receive? Where can I find full FAQs for 21CFR Cloud? Is there an App for the 21CFR Cloud? Is there a free account type for the 21CFR Cloud? Due to the more complex administration involved in 21CFR, free accounts are unsuitable for 21CFR administration. The 21CFR Cloud is intended as a professional service for businesses. What loggers can I use on the 21CFR Cloud? Our 21 CFR WiFi data loggers are specially designed and produced to work with the 21CFR Cloud. None of our standard loggers will communicate with the 21CFR Cloud and they cannot be upgraded to function on it. Would the 21CFR Cloud products be suitable for my company? The product has been designed for companies which want to use electronic means to securely replace their paper records to comply with 21 CFR Part 11 regulations for the Pharmaceutical & Medical industries. Also if you work within, and want to be compatible with, the US Pharmaceutical & Medical industry and to streamline your record taking accordingly, initiating a 21 CFR Cloud would be advantageous. Where can I find the EL-USB data logger software? The software for EL-USB data loggers is free of charge and can be downloaded via the 'Support' page, or by clicking here. Do you issue software updates? We aim to keep up-to-date with the latest Windows variants. New versions are also released when new features are added to the software. Check our 'Support' page for latest versions. What do I need to set up an EL-USB data logger? EL-USB data loggers can be set up using a PC, laptop or an EL-DATAPAD. The EL-DATAPAD* is a handheld device which allows the configuration and download of EL-USB temperature and temperature & humidity data loggers on-the-spot rather than removing the logger from the environment being measured and taking it to a PC. * The EL-DATAPAD is sold separately. Unfortunately, we do not offer an EasyLog software which is compatible with Mac, Linux or Unix at this time. If you do not have access to a Windows PC or laptop, temperature and temperature & humidity EL-USB data loggers can be set up and managed using the EL-DATAPAD, eliminating the need to use a computer (for these logger types only). Do I need to reset the data logger after each time I download the data to PC? The data logger will need to be reset after downloading data from the data logger. Once data has been downloaded, click the "Set up and start USB data logger" button, which will take you through the setup process again. The software would have remembered your previous settings, allowing for quick setup, or you can alter the settings for a new data logging session. How many data loggers can be set up on PC? You can set up as many EL-USB data loggers as you like on a PC, but you can only connect one data logger at one time via USB port. What does '---' mean on the LCD screen of my EL-USB LCD data logger?
' ---' on the LCD display of your data logger indicates that the data logger is not logging. What does 'PS' mean on the LCD screen of my EL-USB LCD data logger? 'PS' indicates that the data logger is in 'Push-to-Start' mode. Pressing the button will start the data logging session. What does 'dS' mean on the LCD screen of my EL-USB LCD data logger? 'dS' indicates that the data logger is in 'Delayed Start' mode. The data logger will start logging at the time specified when the data logger was set up. Can I set up an EL-USB data logger to start logging at a date/time in the future? At the end of the setup wizard, you can choose a start time and date from the drop-down calendar, and the data logger can be left to start logging at the specified time. How do I stop the data logger from logging and turn off the data logger? 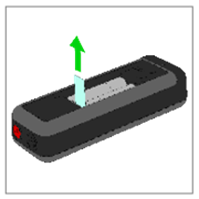 All EL-USB data loggers require connecting to a PC to stop logging. Removing the battery will also stop the data logger from logging, and any data on the logger will be stored on the device until it is downloaded to PC. There is no 'Power Off' button. Can I export the data to Excel? Within the graphing section of the software, there is an Excel button. Click this to transfer the data from the software to Excel. An Excel graph will be generated and the raw data will be copied into a second tab in Excel. Will my EL-USB data logger work outside? Most EL-USB data loggers have an IP rating that is suitable for outdoor use. Check the appropriate model's datasheet for this information. What do the flashing LEDs mean when I connect my EL-USB data logger to a PC? If the LEDs flash sequentially it may indicate that there is a problem with the battery. This could either be a flat battery, which should be replaced, or a battery where a passivation layer has formed. Leaving the data logger connected to a PC for about 30 seconds will remove this layer. After this, remove and reinstall the batteries to reset the data logger. If the LEDs are sequentially flashing after disconnecting the data logger from the PC, the logging session won't start as there is still an issue with the battery. Check the battery condition and repeat the setup procedure. What is a battery passivation layer? Which type of battery should I use in my EL-USB data logger? For most USB loggers you need 1 x BAT 3V6 1/2AA. You will need 1 x CR1620 lithium coin cell. You will need 1 x BAT 3V6 2/3AA. The EL-USB-1-RCG features a non-replaceable, rechargeable battery. If you think the battery has gone flat, connect the logger to a PC for up to five hours. This product uses 2 x standard AA batteries. How long will the battery last in my EL-USB data logger? The battery life will depend on the model type and the logging settings that you selected during set-up. Full battery and other specifications can be found on the relevant model's datasheet. How do I replace the battery in my EL-USB data logger? With the lid off the logger, remove the screw from the opposite end of the logger. Carefully separate the two mouldings and remove the battery from the metal holder. Replace the battery. Remove the battery cover using a small coin or something similar and allow the battery to slide out. Replace the battery with a BATT 3V6 2/3AA and then screw the battery cover back in. Please note that this is a specialist battery that allows for operation of the logger at high temperature. Using unsuitable batteries may result in fire or explosion at high temperatures. Which EL-USB data loggers are compatible with EL-DATAPAD? What operating systems are compatible with the EL-WiFi software? 5) Your wireless network may not support the required 802.11b data rates - check the configuration of your access point or router. Refer to Help Guide 3. 6) On rare occasions, the SSID may contain invalid characters which can stop it from being displayed. Refer to Help Guide 3. My wireless network appears in the list but the sensor fails to connect. What shall I do? 1) Have you selected the correct wireless network? There may be multiple networks with the same name (SSID). If necessary check the MAC Address of your access point or router against that shown in the list of networks. 4) If the wireless network is using WEP Encryption ensure that the HEX key is being entered rather than the password. Online converters are available. The passkey consists of a string of characters A-F and numbers 0-9. What operating systems are compatible with the WiFi software? Select the sensor you wish to delete and right click. From the options select Delete Device. What does the syncing icon in the software mean? If your PC has been turned off, when you turn it on again, the sensor will awaken and reconnect after a maximum of 30 mins. After the sensors have successfully reconnected the data stored in their memory will be transferred to the PC. Whilst this data is transferring the syncing icon will appear. Yes, both Apps are free of charge to download from the AppStore and GooglePlay. Can I use the App if I don't have a Cloud account? Can I change device settings using the App? Android users have all the functionality of the Cloud as well as exclusive features just for the App. You can change settings on both apps. Can I use the App if I have a 21CFR Cloud account? How do I mute the alarm on the EL-WiFi-ALERT? Press the button on the EL-WiFi-ALERT once or remotely via the PC software. What do the different LEDs on the EL-WiFi-ALERT mean? Bottom right LED constantly on: the Alert is powered up and waiting to be configured. Bottom right LED flashing: the Alert is powered up and searching for the WiFi access point it has been configured for. All LEDs flashing/chasing around the outside edge: the button has been pressed for 10 seconds and when released the Alert will restart. How do I activate the WiFi signal strength indicator on the EL-WiFi-ALERT? Press the button three times. All LED's and a fast beep indicate a strong signal. Limited LEDs and a slow beep indicate a weak signal. How should I power my EL-WiFi-ALERT? The EL-WiFi-ALERT has been designed to be continuously powered via the mains. However, it does contain a rechargeable lithium polymer battery for positioning the device and for limited power during the event of a mains failure. Do I need an EasyLog Cloud account to use the API? You will need to have a Professional account in order to use the API. Contact us to request an APIToken and reference document which will allow access, through the API, to your account. How do I turn off the data logger? These loggers cannot be fully powered off and the battery is not removable. There is a 'Start/Stop' button which can be used to start and pause logging. How can I tell if my EL-CC or EL-PDF data logger is running normally? Status information can be retrieved by pressing the red and white circular button on the device itself, causing an LED to flash. Refer to the Quick Start Guide for explanations of what the different flash combinations mean. Are EL-CC and EL-PDF data loggers waterproof? The plastic wallets are IP67 rated, so the loggers remain waterproof until the seal on the plastic wallet has been broken. Does my EL-CC-2 data logger have an alarm for humidity levels, as well as temperature? Unfortunately not, the alarms on these loggers are only set for temperature but they will record data for both temperature and humidity. FilesThruTheAir can provide custom versions of EL-CC data loggers, with temperature and humidity alarm zones set at your desired levels. Please contact sales@filesthrutheair.com should want to know more about this service. Can I change the temperature alarm zones on EL-CC or EL-PDF data loggers? Unfortunately not, the alarms on these loggers are only pre-determined and cannot be changed. However, FilesThruTheAir can provide custom versions of EL-CC data loggers, with temperature and humidity alarm zones set at your desired levels. Please contact sales@filesthrutheair.com should want to know more about this service.